There is no utility shipped with the product or available for download. I tested the PG-9172 using our standard powerline test procedure, with all results entered into the Powerline Performance Charts. Since G.hn performance is in the same ballpark as "1200 Mbps" AV2 MIMO adapters, I decided to compare it to the three highest-ranked AV2 MIMO adapters: TRENDnet's TPL-420E2K, NETGEAR's PL1200 and D-Link's DHP-701AV. The Downlink Throughput plot below shows the PG-9172 at 263 Mbps doesn't approach the ~400 Mbps peak Location A throughput of the TRENDnet and NETGEAR adapter pairs. But I should note, Comtrend sent a note warning against "short loop" (closely spaced) testing, saying it isn't typical in actual powerline adapter use. While the point is valid and accepted, "short loop" (we call it Location A) testing is part of our standard benchmark suite and many products have no problem with the test. That said, the Comtrend adapter does quite well in the mid and far-range Location C test and turning in its best comparative performance in worst-case Location E with 148 Mbps. This is actually the best throughput we've ever measured in Location E for any powerline adapter tested! 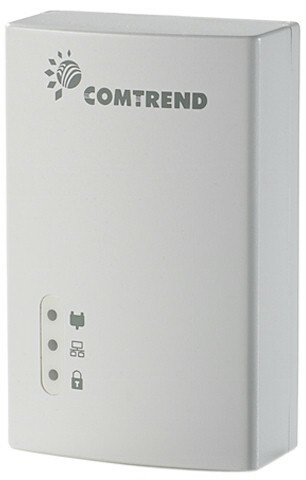 The next best products are the TRENDnet, D-Link and NETGEAR products shown in the chart below. Looking at the composite IxChariot downlink plot shows fairly steady throughput in all three locations. The jump at the beginning of the plot is the IxChariot Nagle's algorithm quirk. For uplink, the PG-9172 again beats the other three products only in Location E with 141 Mbps. Maximum Location A throughput is better than downlink at 308 Mbps. The uplink IxChariot plot shows low throughput variation in all three test locations. The PG-9172's simultaneous up /downlink IxChariot plot shows higher average uplink throughput than downlink, with no battling for dominance. The 336 Mbps total throughput is only a moderate (9%) increase over the 308 Mbps maximum uplink throughput. Adding another simultaneous stream pair adds only 17 Mbps for 353 Mbps of total throughput. Noise tests run in Location E are harder to parse than I've seen with HomePlug AV2 products due to higher variation in the test runs. The red bottom trace shows throughput with a noise source plugged in for the duration of the test run. Aside from the initial jump up around 10 seconds in due to IxChariot's Nagle quirk, there's basically no increase in throughput over the run, which indicates the adapter isn't working around the noise. If it had, we should expect to see throughput move up on the bottom trace. The top blue trace shows a delayed response when the noise source is unplugged at the 30 second mark. Throughput takes around 5 seconds to move up after the noise source is removed. My conclusion: G.hn noise handling behaves similarly to HomePlug AV2 products, although a bit more slowly; it has limited ability to adapt to line noise. I discovered long ago that some AFCI circuit breakers can severly reduce powerline performance for HomePlug products. So I wanted to see how G.hn and my HomePlug-killing AFCI breakers interacted. The plot below shows a pair of NETGEAR PL1200 AV2 MIMO adapters in two configurations. The top trace shows downlink throughput in our normal Location A single-outlet test. The bottom _alt trace shows downlink throughput with one adapter plugged into an outlet in my office, which is behind an AFCI breaker and the second adapter plugged into a hallway outlet right outside the office door, which is protected with a normal circuit breaker. Throughput reduction is severe; around 70%. The plot below shows the same test with a pair of Comtrend PG-9172s. This time reduction is only 45%. Not great, but not as bad as Homeplug. It didn't take long to confirm that G.hn and HomePlug don't interoperate. Plugging Comtrend and NETGEAR PL1200 adapters into my office outlets would not light the powerline link rate on either adapter. So I moved on to seeing if they could co-exist. My test used the Comtrend adapters and a pair of NETGEAR PL1200 HomePlug AV2 MIMO adapters, plugged into two outlets in my office. The first test mixed adapter types in each outlet, as shown in the photo below. I alternated the adapter plugged into the wall and unfiltered outlet strip to even things out, i.e. the Comtrend was in one wall outlet while the NETGEAR was in the outlet strip on one end and vice-versa on the other end. The result in this case was that I had to unplug the AV2 adapters to get G.hn pair to link. The AV2 adapters linked with no problems. Once things were linked, I started a single IxChariot test between each pair of adapters and found the G.hn pair unlinked as soon as traffic started on the AV2 pair. I got the same result on multiple attempts. My second try put the same adapter types in each outlet, one still wall-plugged and the other on the outlet strip. This time both G.hn and AV2 adapter pairs linked and were able to run the 1 minute IxChariot test. The plot below shows G.hn throughput drops to about a third of its solo throughput, while HomePlug throughput is held to under 20 Mbps. Starting the HomePlug AV2 pair first shows its throughput gets stomped down below 20 Mbps—about an eighth of its peak. G.hn's throughput is also reduced, but only to around 100 Mbps. If you're going to use both G.hn and HomePlug adapters, physically separate them as much as possible. As noted earlier, I'm treating G.hn as a different powerline class, so it stands alone in the Powerline Ranker. But if you filter the Powerline Charts to show only G.hn and AV2 MIMO products, you'll find the Comtrend's average performance smack in the middle for both down and uplink. As noted earlier, G.hn's strength, at least in the form of Comtrend's PG-9172, is at long distances. It produced almost 150 Mbps of usable throughput compared to the best AV2 MIMO product that yielded only 125 Mbps. So if you haven't had luck getting decent throughput with HomePlug AV2 in a far away room, you might see if G.hn can do the job. But a few caveats are in order. First, G.hn's place in the consumer home networking universe is not assured, especially since Homeplug performance has caught up with AV2 MIMO. Instead, G.hn looks focused mainly on service providers, much as MoCA is. This LightReading article from January 2014 notes multiple field trials by service providers and Googling for g.hn deployment brings up the most recent news of only one actual G.hn deployment—using Comtrend devices—by Jazztel in Spain. Second, larger consumer networking players like NETGEAR and Linksys and even smaller ones like TRENDnet and ZyXEL have not yet produced consumer G.hn adapters and I see no sign of plans to do so. So if you're going to go for it, be aware you could be heading down a lonely path. Finally, Comtrend needs to step up its game on customer support. Its current website, has no support information for the PG-9172. No downloadable quick start or user manuals, no FAQ and not even a user forum. The footer links (Home | About | Contacts | Feedback | Help | Site Map) on product pages are malformed and just bring you to the top of the product page, so you can access them only from the site home page. The good news is that the Help and Contact Us links bring you to the Contact Us page, which has U.S. phone and physical address information. And there's also a 2 year warranty. Comtrend said its website is currently being upgraded and the new one will address many of the problems. But I think I'd feel better about suggesting you even consider trying a pair of G.hn adapters if the Comtrend PG-9172 wasn't the only one you can buy.